Our Hedgehog Wheel Article describes the health and entertainment/enrichment benefits of providing your hedgehog with a wheel. As with most good things, there is a price and the price for providing your hedgehog a wheel is the risk of having to clean it. Wheels have a tendency to cause hedgehogs to forget all about using the litter pan. Some considerate hedgehogs will stop wheeling and hang their little tail end off the wheel to do their business – don’t expect this from your pet. When a hedgehog runs it releases its bowels and urinary tract. By running, the hedgehog is kick starting its metabolism and urgently needs to expel waste much like a human does after a warm cup of coffee. When a hedgehog is running, it believes it is leaving its waste behind it and unlike a dog will not search for a place to go to the washroom. Hedgehogs on a wheel will release their bowels much like they do in the wild; however, in this instance the hedgehog does not leave its feces behind, but continues to run through it. With a hedgehog, this is inevitable. It is likely you will have to clean the wheel daily and provide your hedgehog with weekly foot baths in a shallow sink or on a damp cloth to get off the boots covered with feces. Many hedgehogs have so much fun running on the wheel that they simply do not take the time to get off the wheel to use the litter pan. One of the best ways to discourage wheel pooping is to wait a couple of days after you take your hedgehog home before putting in its wheel. Allow your hedgehog some time to hopefully establish a litter pan routine. Wheeling and hedgehogs is comparable to potty training toddlers at the park. They are just having too much fun to stop and do their business in the right spot. It is simply easier to go on the run! Chances are if you are reading this article your hedgehog already has a problem. Don’t be discouraged though. One of our customers, KW, started taking his hedgehog’s wheel out at night and giving it back in the evening. After a few days the messes in the wheel quit! Cody Ruffing, a Millermeade Farm’s customer, found that positioning the litter pan and wheel so that his hedgehog would have to go through the litter pan to get to the wheel helped his hedgehog use the litter pan before getting onto the wheel. Our best suggestion for completely frustrated hedgehog parents is to invest in a new wheel. A new wheel may not cure the problem, but it sure will make clean up a lot easier! 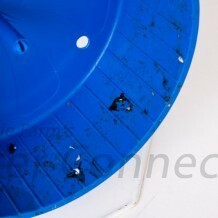 The wheel’s design and construction material play an important role in how easy it is to clean the wheel. Some types of plastic such as in the Cake Walk Wheel or the Carolina Storm wheel are much easier to clean than other types of plastic. Other wheels such as the Giant or Wobust Wodent Wheel are very nice wheels, but they are more difficult to clean because of the way they are constructed. Wheels with a smooth surface may be wiped out whereas other wheels may need to be scrubbed. Depending on how messy your hedgehog wheel gets, it may be worth the investment to experiment with different types of wheel and check how easy they are to clean. Many hedgehog owners have found that lining a wheel with Glad Press’n Seal can save time cleaning up. Simply tear strips of Glad Press’n Seal the width of the wheel to cover most of the surface. It will take two to three strips depending on the size of/type of your wheel. Over time some sticky residue may develop, but a non-toxic degreaser or alcohol should take away the residue. If you live near a glass supply store, you’ll find that they sell sheets of a sort of sticky vinyl—intended as masking for people who sandblast glass. The strips are noticeably easier to clean than the plain wheel. The easiest poop to get off is fresh poop, so a quick clean each morning may help prevent more scrubbing, soaking, or spraying in the long run. It is pretty common to have to clean a wheel with dried on feces. The first thing we suggest is knocking off as much as possible with a stiff brush. Be careful not to scratch the surface of the wheel or it will be harder to clean in future. Next, soak the wheel to make your final scrubbing easier. You can soak the wheel in plain soapy water or in a non-toxic disinfecting solution such as Chlorhexidine. The soaking water may get quite dirty, so a large dishpan or a tub large enough to fit your wheel might be handy in order to help you pour the dirty water down the toilet. Once your wheel has soaked, you are ready for your final scrubbing. Be careful about soaking metal parts of bucket wheels or other wheels that use parts that are not stainless steel to prevent untimely rusting. Another way to clean and disinfect your wheels is to thoroughly spray the wheels first with white vinegar and then with hydrogen peroxide and let them soak. The combined action of the vinegar and peroxide has extremely effective disinfecting powers. Both vinegar and hydrogen peroxide are not only safe, but they are also cheap and handy to have around the house. Some people prefer to pressure wash their wheels. Lori Keller, long-time owner of multiple hedgehogs likes to take a whole batch of her wheels to the car wash and clip them to the wall with the car mat holders. We are told her wheels come clean in no time at all. One must be careful with using very high pressure while pressure washing so that the wheels aren’t damaged. The pressure may also blow away wheels that are not properly secured. Different people have found different methods to be more convenient or easy to use than others. Try different methods and see what works best for you. No matter what method you choose to clean your wheel with, make sure your cleaning solution is non-toxic and that your wheel is thoroughly rinsed before returning it to your hedgehog’s cage. Finally, keep in mind that it is best to clean wheels on a regular basis than to wait until they are extremely dirty making the task more difficult and time consuming. I found out with Minerva that when the wheel and litter were in opposite corners she would NEVER use the litter pan before getting on her wheel and would just lay in her litter on occasion. Then I got a litter pan big enough to put the wheel in and now she goes before she gets on her wheel. Her cage is so much cleaner now! My Hedgie uses the litter box when the wheel is out…and then uses the litter box as a bath when the wheel is in. I just clean the wheel on a daily basis.